The classic pea coat has long been one of my go-to wardrobe staples - a timeless piece I can rely on for its unfailing, everywhere-suitable chicness. Now with Swedish fashion editor/blogger (and my girl crush) Columbine Smille working this silhouette like crazy this season, my obsession with it grows stronger still. 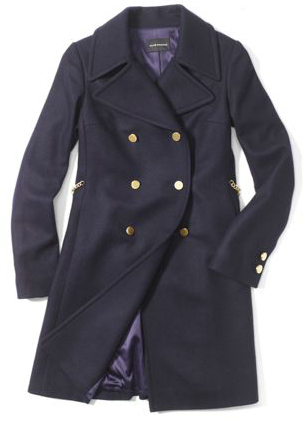 The result: I am all over this polished pea coat, nicely accented by a gold link chain belt that stretches across the back. How amazing would it be layered over this outfit? *I am actually wearing this cashmere sweater as I write this - I bought it on Monday. It's super cozy and goes with everything! Gorgeous look! I love the sequin pants...perfect evening with friends for a NYE party? Ah, Columbine is my girl crush too! How amazing is she!!! !